The Universal Audio LA-610 Mk II is a second-generation revamp of the original LA-610 design. While the preamp and compressor are identical to the original LA-610, user-requested features such as true compressor bypass, larger metering, improved output signal, an auto-sensing power supply have been added bringing the end user an enhanced user experience. The LA-610 Mk II also features the highly popular black on black cosmetics of the LA-610 Signature Edition. The LA-610 Mk II packs tremendous sonic versatility and is an ideal front-end for tracking with modern DAWs and the serious project studio looking to get the UA sonic experience: real quality and character at an accessible price. The LA-610 Mk II is based on the legendary console modules developed by Bill Putnam in the 60's. Noted for their musical character and warmth, countless classics from Sinatra to Van Halen have been recorded using these preamps. After the preamp section, the LA-610 Mk II offers the T4 optical compressor. The simple operation and program dependent nature of the LA-610 T4 compressor provides the same extremely musical control that has made the LA-2A such a well-loved classic for over 40 years. The electro-optical detector or T4 cell is the very heart and soul of the Teletronix LA-2A. The unique combination of electroluminescent panel and photo-resistors inside the T4 cell are the crucial circuit components that give both compressors their signature sound. Universal Audio LA-610 MkII Features. Based on Legendary Bill Putnam 610 Tube Mic Pre and EQ Used on Countless Classic Recordings. Authentic Teletronix LA-2A-style T4 Opto-Compressor. Complete vintage channel-strip at groundbreaking price within project studio reach. Mic Pre with Gain and Level controls, variable impedance switching, and Instrument DI for recording tone color. Mk II Features True Bypass, Larger Metering and Improved Signal Output. Universal Audio build quality and heritage, audiophile components, hand-assembled in the USA. Mic, Line and Hi-Z Input, Line Output. Dual Impedance Mic and Hi-Z inputs (Mic: 2K, 500O, Hi-Z: 2.2M, 47KO). 5 position Stepped Preamp Input Gain, Continuous Preamp Output Level. 15dB Pad Switch (15dB Pad/Off). 48 volt Phantom Power switch (+48v/Off). +/- 9 dB stepped High Shelving Filter (4.5, 7, 10 kHz). +/- 9 dB stepped Low Shelving Filter (70, 100, 200 Hz). T4 Optical Compressor with Continuous Peak Reduction and Makeup Gain. Compress/Limit/Bypass Modes of Dynamic Operation (3:1 / 8: 1). Meter Source Selector Switch (Preamp/Gain Reduction/Compressor). Front Panel Power switch (On/Off). Custom Altran and Cinemag Transformers. 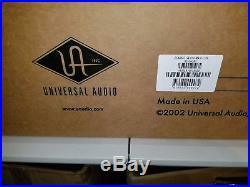 Universal Audio LA-610 MkII Specifications. +/- 9 dB stepped High Shelving Filter (4.5, 7, 10kHz). +/- 9 dB stepped Low Shelving Filter (70, 100, 200Hz). Compress/Limit/Bypass Modes of Dynamic Operation (3:1/ 8: 1). 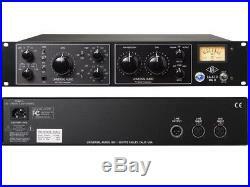 The item "Universal Audio LA-610 MkII Classic Tube Channel Strip Preamp NEW IN BOX" is in sale since Friday, November 17, 2017. This item is in the category "Musical Instruments & Gear\Pro Audio Equipment\Preamps & Channel Strips". The seller is "kildor33" and is located in Fort Wayne, Indiana.